Mason Gaffney is Professor of Economics at the University of California, Riverside. He has written extensively on various aspects of resource economics, urban economics, tax policy, and capital theory. After a career as an investigative journalist, he was advisor to a number of Russian academic and political bodies, including the Duma (parliament), in their efforts to implement a more equitable transition to a market economy. Recently he has turned his attention to the failure of economic analysis and public policies in the market economies. In a separate article, Lord Wolfson, the chief executive of the Next clothing chain, explained why he had set up the prize: ’Just as man can be dwarfed by the power of nature, so might governments be humbled by the force of markets. There is a possibility that the structural flaws at the heart of European economic and monetary union pose such a challenge and that the euro could break up in a disorderly rout. The main article reports that the ‘Wolfson prize will be the second-biggest cash prize to be awarded to an academic economist after the Nobel and asks potential applicants to submit an article of up to 25,000 words considering how transition from the euro to a new national currency could be achieved’. In what appears to be a reference to the prize, the following day The Times carried another article which begins with the question ‘be brutally honest: do you have any idea how the world got itself into its present financial mess, or how it might get out of it? …No? Perhaps you console yourself with the thought that it doesn’t matter … because there are plenty of smart economists out there who do … Yes, those smart economists do indeed have a shrewd prescription … The bad news is, they’re not all the same … We snigger at fortune-tellers yet continue to take seriously the word of economists, a profession definable as ”people who have found a way to retain professional tenure even when their predictions turn out to be entirely wrong”’. 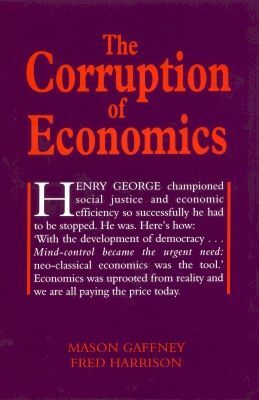 In The Corruption of Economics the authors document how the integrity of economics as a discipline was deliberately compromised towards the end of the 19th century. One result of this perversion of economics was that economists were unable to answer the Queen’s question. Shortly after the collapse of Lehman Bros, the Queen visited the London School of Economics to open a new building. Entertaining her, the professors spoke of the magnitude of the financial collapse. After listening to them, the Queen posed a simple question: ‘if it is so big, why did no one see it coming?’ This was a question the economists could not answer. The answer, however is given on the first page of the Prologue in Boom Bust which may be viewed on this link.